147 West 24th St. 2nd floor; NYC; 212-633-6646. Facebook. FB Event. 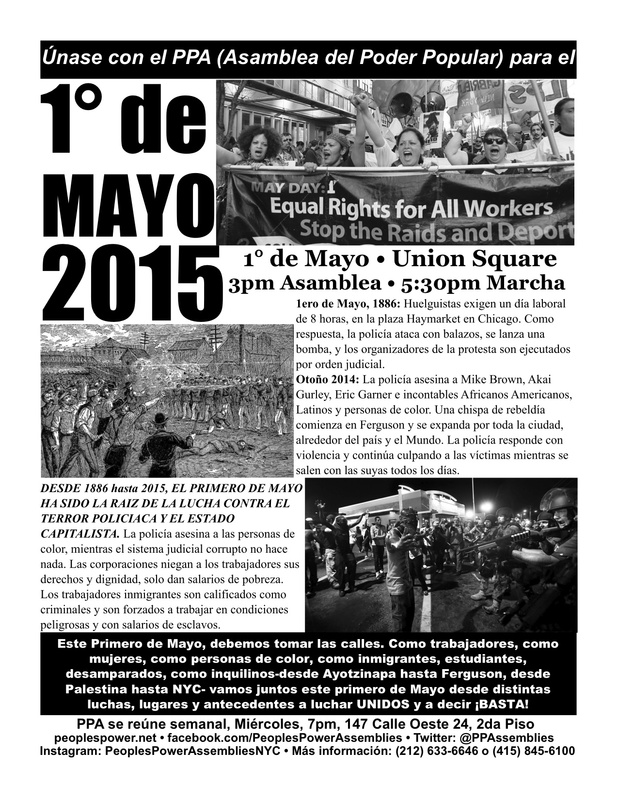 –Sat, April 24, 2015: Free Mumia Demo. Click image to enlarge for details. -Tues, April 14, 2015: ShutItDown action: 2pm at Union Square. FB Event. 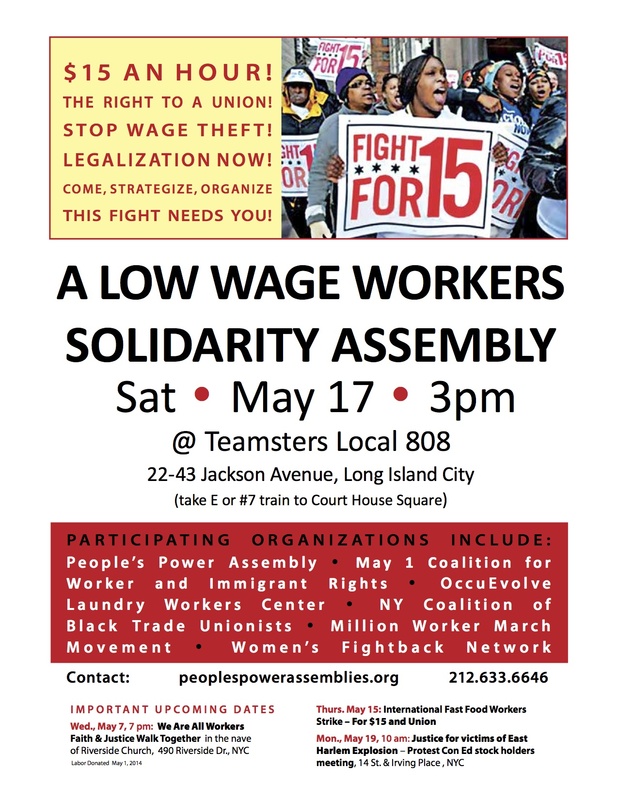 -Wed, April 15, 2015: Nationwide Fight for $15/hr & a Union: 4pm Columbus Circle. FB Event. -Support the Laundry Workers (see info); trailer for incredible movie: The Hand that Feeds. 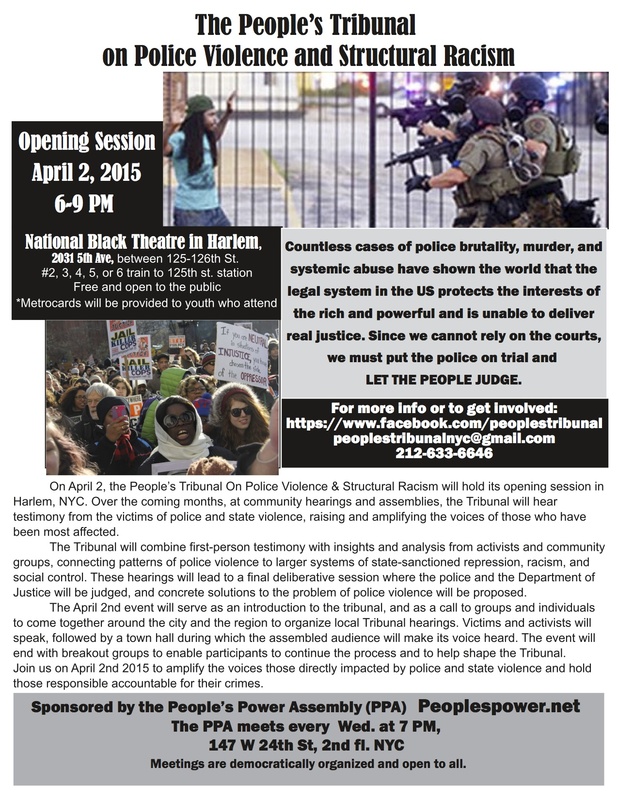 –Report from exciting & inspiring April 2, 2015 Peoples Tribunal. Youtube. 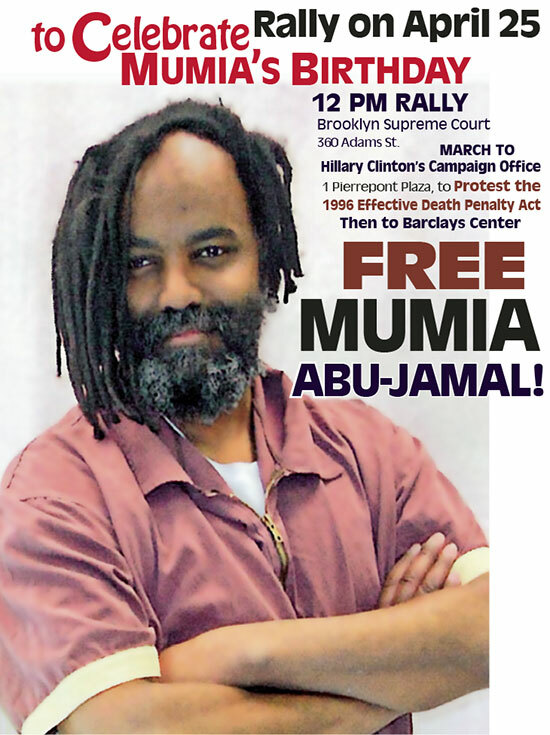 ****Friday, April 10, 2015: National Day of Action for Mumia! No execution by medical neglect! 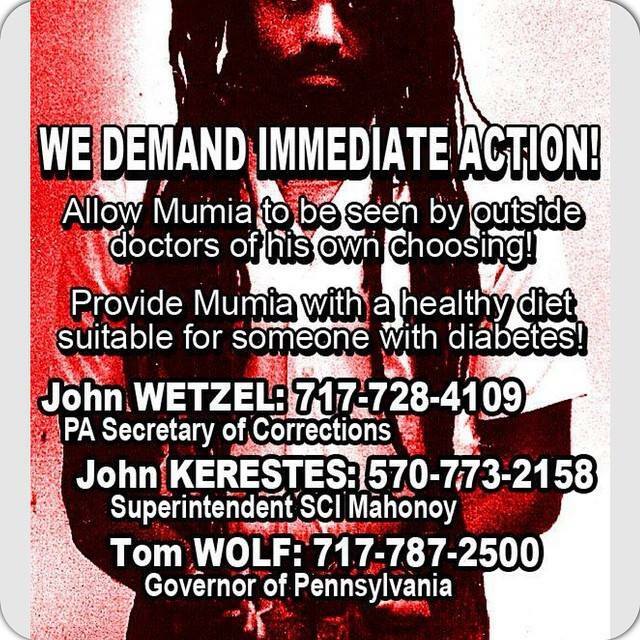 We are demanding Mumia be transferred to outside medical specialist to be treated by unbiased medical professionals! 5:00pm @ Adam Clayton Powell Jr Plaza, W 125 St, Harlem. Click here for more info. 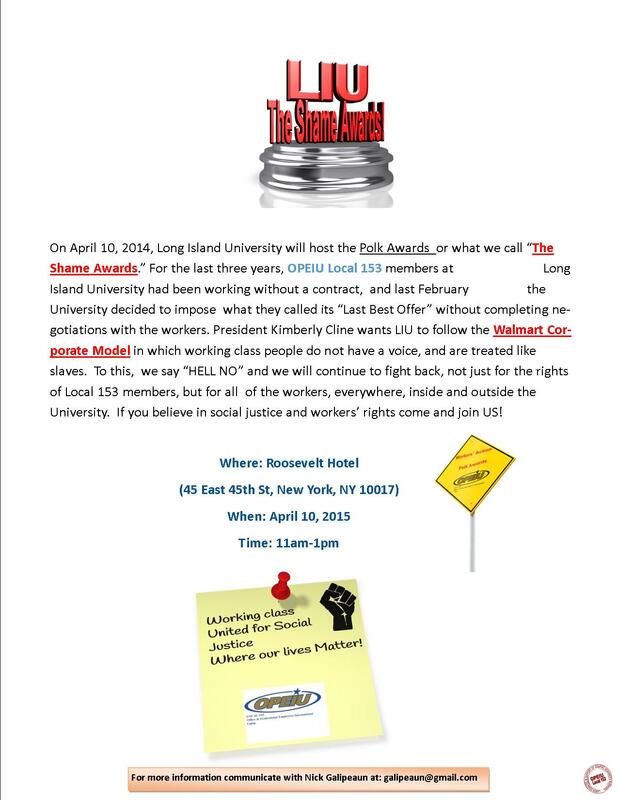 Support the LIU workers in their struggle for a decent contract. It is only through solidarity of the community, students and workers, that all workers will win against the bosses. –Monday, April 13th: Come celebrate and @ the Liberato Workers’ picket line, 5:00pm, 1W 183rd Street, Bronx, NY. Bring your favorite color balloon! –Tuesday, April 14th: No More Business As Usual. No work, no school, we march and rally against police brutality and unwarranted abuse of state power on black and brown people everywhere! 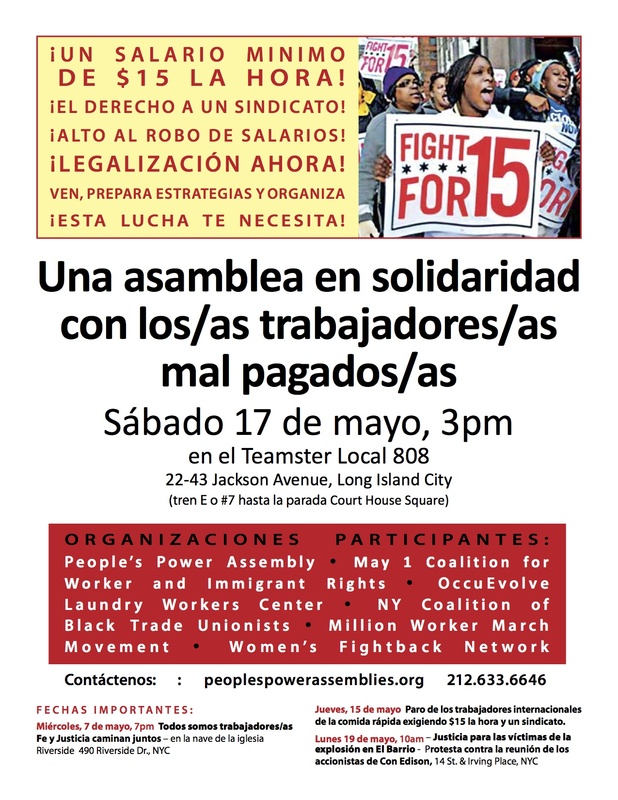 –Wednesday, April 15: March for 15$ an hour, hosted by group Fight for 15$ . 63rd Street and Central Park West (near Columbus Circle). Rally begins at 4pm. March starts at 6pm. -Beginning April 16th will be a series of planned events involving the caravan from Mexico that has traveled to the US with students from Ayotzinapa and family members of some of the 43 normalistas that were murdered in Mexico last year. Tentative plans include a march on Washington Square Park on 4/26. –May 1st: MayDay! 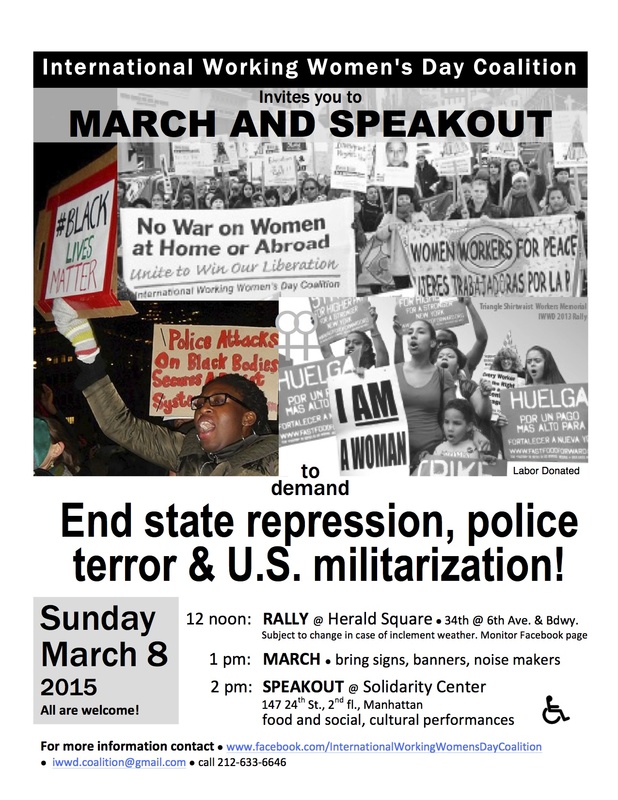 3 pm, Union Square, step off at 5:30! 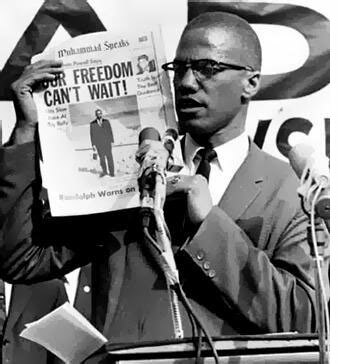 February 2015: Black Future Month: Actions all month! the police precinct where Malcolm organized a protest against police brutality in 1957. **URGENT: SATURDAY, FEBRUARY 14: 1pm. March Against Islamophobia & Hate. CNN TO FOX NEWS.GATHER: 1 PM OUTSIDE CNN AT COLUMBUS CIRCLE.59 STREET AND EIGHTH AVENUE. MARCH TO FOX NEWS 1211 AVENUE OF THE AMERICAS. (Endorsed by NYC PPA.) FB Event. **Monday Jan 9, 2015. In NYC: 5 pm Foley Square. (Rally, Die-in/Sing In-Reading the NAMES). –Mon, Feb 9: Direct Action Grand Central Terminal: 7pm. FB Event. 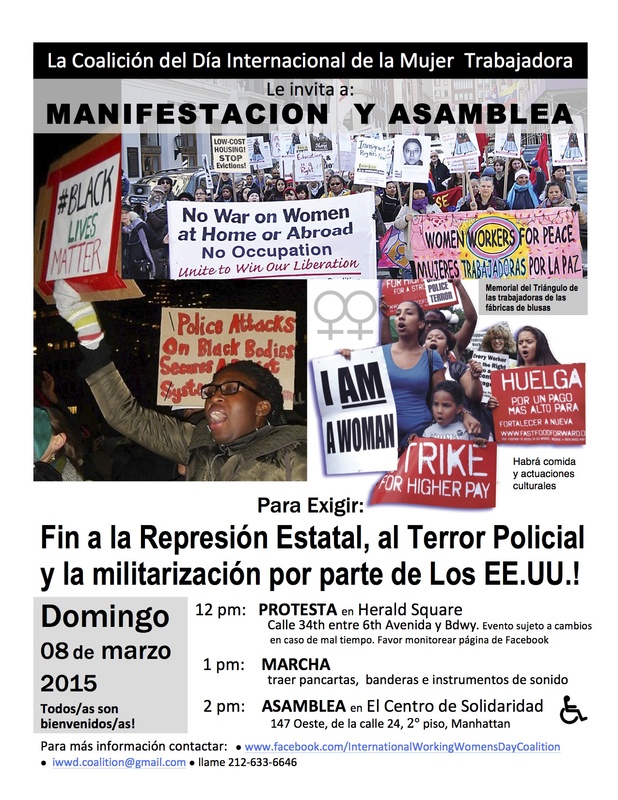 –Sat, Feb 7: THE 1st ANNUAL RAMARLEY GRAHAM BRONX JUSTICE MARCH AGAINST TERRORISM! 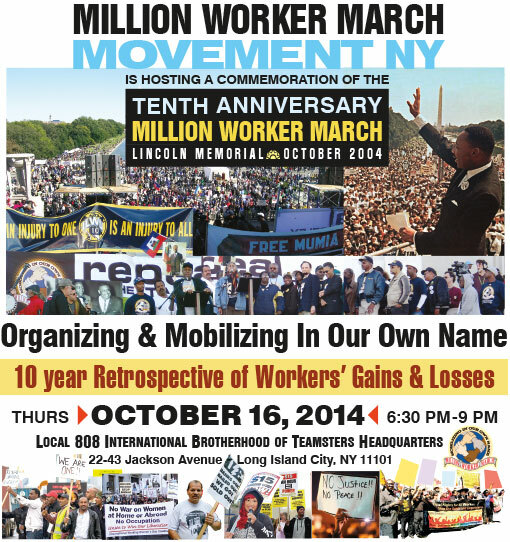 1:00PM: Gather, Rally & Line Up For North Bronx Protest March @ White Plains Road/Gunhill Road #2 Train Station Stop. Walk Out! Sick out! Don’t Go IN! PPA FB or OWS-OE FB. -Staten Island: meet at 9am at 30 Bay St (site of Eric Garner’s murder), will take ferry to PBA then meet at Union Square at noon for sing-in. **Other actions MLK weekend see BELOW & also: PPA FB Event &/or PPA FB StrikeAgainstRacism &/or occuevolve/calendar &/or WeekOfOutrage: Upcoming Events. -Fri, Jan 16: 11am – 125 Broad St. NYPD Slowdown Community Speakout. -Fri, Jan 16: 5pm – East 55th St & Church Ave, Brooklyn. March for Kimani Gray, Shantel Davis, Akai Gurley. FB Event. -Sunday, January 18, 11am, at 64 Central Park West – NY Society fo Ethical Culture hosts a workshop on MLK. -Monday, January 19, 2pm, at Union Square, 4 MILE MARCH NYC. Join this call to action on MLK Day to demand accountability from law enforcement and honor the lives of those who have lost their lives to racist police brutality. More info on FB Event. -Monday, January 19 at 12:00pm New York – FB Event. -Wednesday, January 21, 7pm, at 147 W 24th St, 2nd Floor: NEXT PPA MEETING. We’ll discuss continuing steps in the fight for racial and economic justice, as well as how we can better call the movement out to Staten Island for Erica Garner. -Thursday, January 22, 9am, at 18 Richmond Terrace, Staten Island: STAND IN SOLIDARITY WITH RAMSEY ORTA! Pack the court to support Ramsey Orta, the man who filmed Eric Garner’s violent, racist murder. See FB page. –Fri: Jan 2: 2-4pm: #HAPPYNEWYEARS-Die In And Shutdown Of Racist 1% NY POST/FOX NEWS ! Because Black Lives Matter! 1211 6th Ave, New York, New York. See FB. 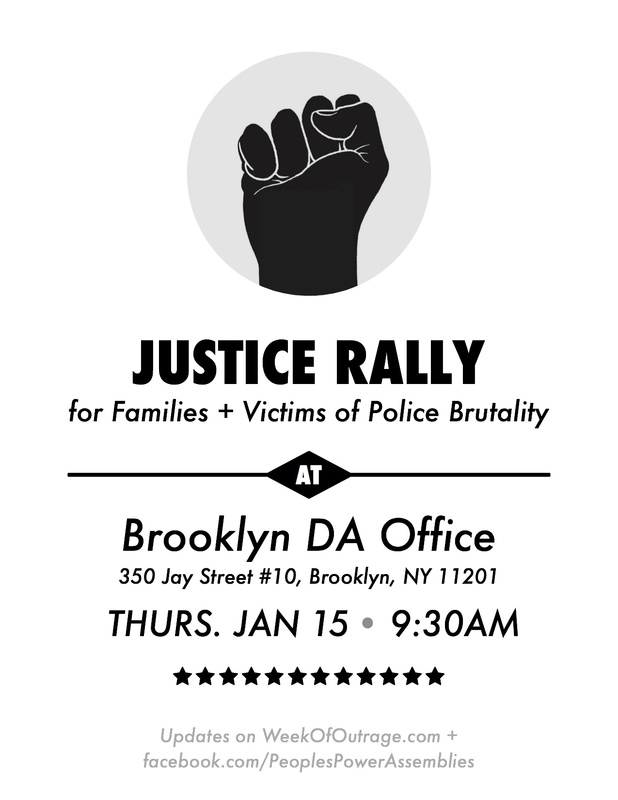 –Fri: Jan 2: 5pm: *KEEPING FOCUSED** Justice for Eric Garner and Mike Brown. Federal Hall Steps, 26 Wall St. See FB. –Thurs: Jan 1: 5pm. HappyNew Years action– Grand Central Terminal, 89 E 42nd St, New York, New York 10017 – I CAN’T BREATHE-SING IN (song goes viral; gather everywhere: make it go worldwide). See FB. –Wed: Dec 31: 8:30pm. 2015-Rock in the New Year With Resistance to Police Murder! Union Square (In Front of Ghandi Statue Near 5th Avenue) See FB. –Sat: Dec 27: Justice for Akai Gurley demonstration, 2 PM; the Pink Houses. See FB for details. –Fri: Dec 26: Stop Protesting? Hell No! PPA & Occuevolve joint meeting. 7pm. Solidarity Center. –Dec 23, 2014: Shut Down 5th Ave. 5pm. 59th & 5th Ave. FB. –Dec 23, 2014: South Bronx Can’t Breathe. 6pm. Hunts Point Ave & Southern Blvd. FB. -See PPA FB Event & occuevolve.com calendar for other actions prior to New Years. ***Protest outrageous pro-cop rally: Dec 19, 2014. 5pm. City Hall Park, NYC. 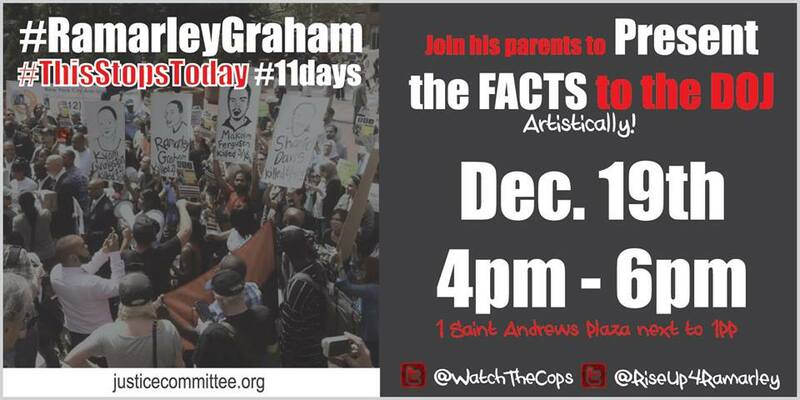 –Fri: Dec 19: The #bluelivesmatter action is happening at the same time that the family of Ramarley Graham is having a #RiseUpForRamarley Department Of Justice Action . SEE FB. –Fri. Dec 19: POSTPONED: Details on rescheduling coming. 12pm: RALLY & MARCH. BLACK POWER! A DAY OF OUTRAGE AGAINST WALL ST & THEIR KILLER COPS. Assemble Broadway & Fulton. 718-398-1766. -1-3pm: Broken Windows Kills Part 2!#We Can’t Breathe/Stops TODAY! ►WORK SESSION TODAY to help prepare and also carry materials down to the action. Come to the Solidarity Center 147 W 24th St., 2nd floor1:30 pm – 4:30 pm. The Solidarity Center will be open as a ►SAFE SPACE for activists. Please call us / Report in if you have been ARRESTED, Witness an ARREST or are doing JAIL SUPPORT at a demonstration. Please contact the Nat’l Lawyers Guild NLG-NYC HOTLINE at 212.679.6018. 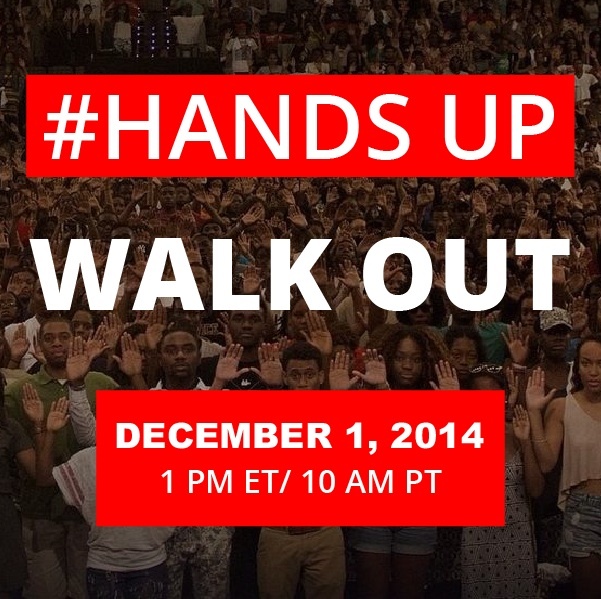 –MONDAY: Dec 1: Mass Walkout #HandsUpWalkOut: Support a mass walk out from work & school starting at 12 PM EST (not 12 CST). (The time Michael Brown was murdered.) Get an image to share. COME TO UNION SQ: FB Event. CALLING ON all NYC Activist, Student, Community and Worker Groups to help SHAPE & Plan this Ferguson-led National Day of Walkouts. WE ARE OPEN TO YOUR IDEAS & MULTIPLE SCENARIOS . PLEASE ADD FRIENDS TO THE PAGE & Let us know if you want to be listed as a HOST. We would like to have a planning meeting over the weekend. Pls Contact imani@peoplespowerassemblies.org . Come to UNION SQ at 5pm TODAY (Monday) if you can . 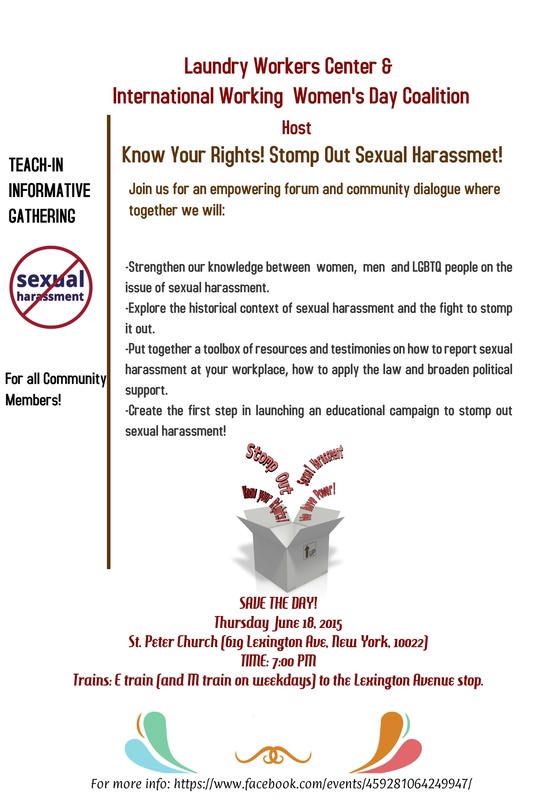 Some folks will be coming from Tompkins Sq Park to Union SQ at 6pm . Some also have called for 7pm . TOMORROW TUESDAY 11/25/14 – official PPA demo at 5pm and Trayon Martin Committee demo at 7pm. 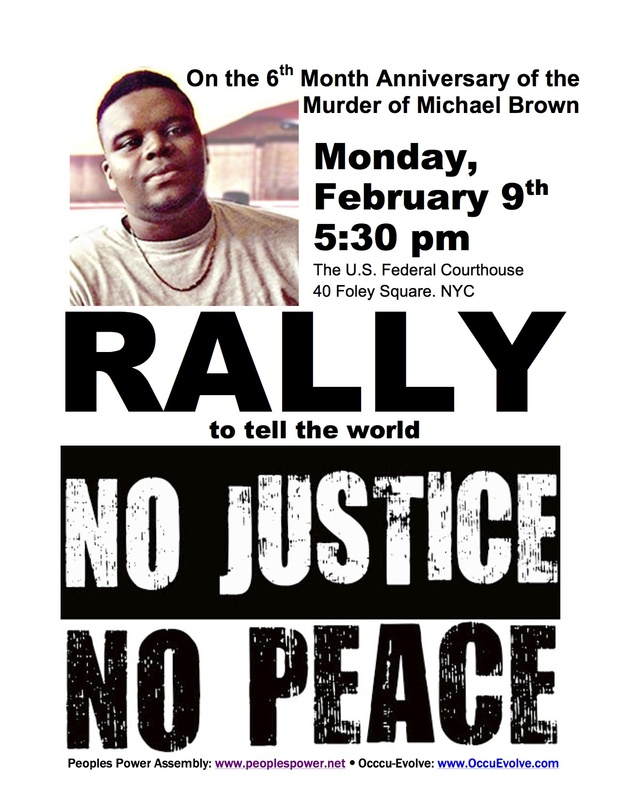 -NYC 5 PM DAY OF: Union Square; JUSTICE FOR MICHAEL BROWN: Afternoon of day: EMERGENCY RESPONSE PROTEST IF THE FERGUSON GRAND JURY DOES NOT INDICT Darren Wilson. In NYC, gather at Union Square Park, 14 Street & B’way 5pm on the evening of a grand jury decision that lets the cop killer DARREN WILSON off. Also 7 PM DAY OF: Union Square; FB info. 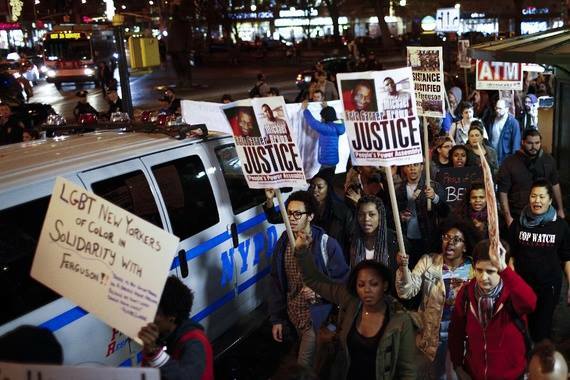 –NYC DAY AFTER 7 PM: Turn Up for Mike Brown – 7 pm Union Square; 14 St & Broadway. –NYC: Bike Block for Justice for Eric Garner & Michael Brown: TBD – Tompkins Square. 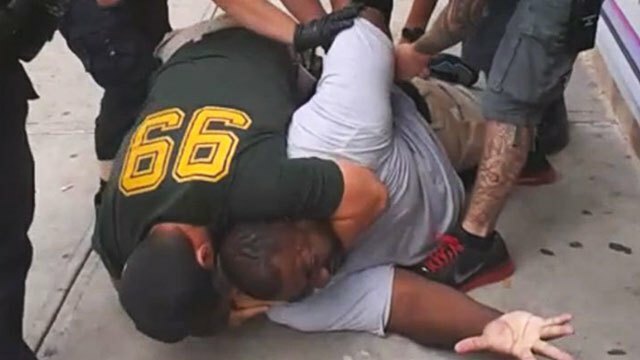 -For ERIC GARNER: The verdict in the grand jury is coming soon! We don’t know when yet, so stay tuned. The action, regardless of verdict, will be the Day AFTER in Foley Square: weekday at 5:30pm; Saturday 1pm. Spread The Word! FB info . #EricGarner . 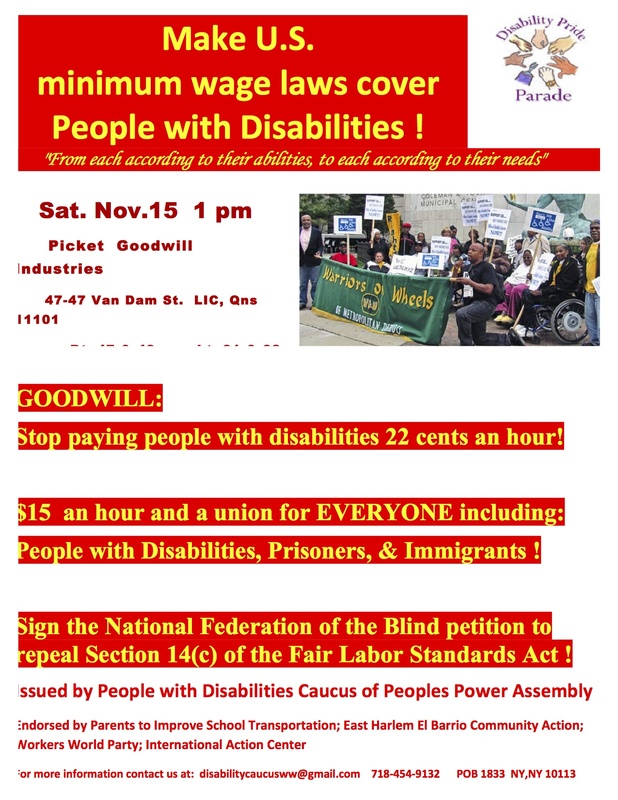 -Sat, Nov 15: 1 PM Demonstrate at Goodwill: Stop paying people with disabilities 22c/hr; We demand $15/ hr & a union for EVERYONE including: People with Disabilities, Prisoners, & Immigrants. (Click to enlarge). 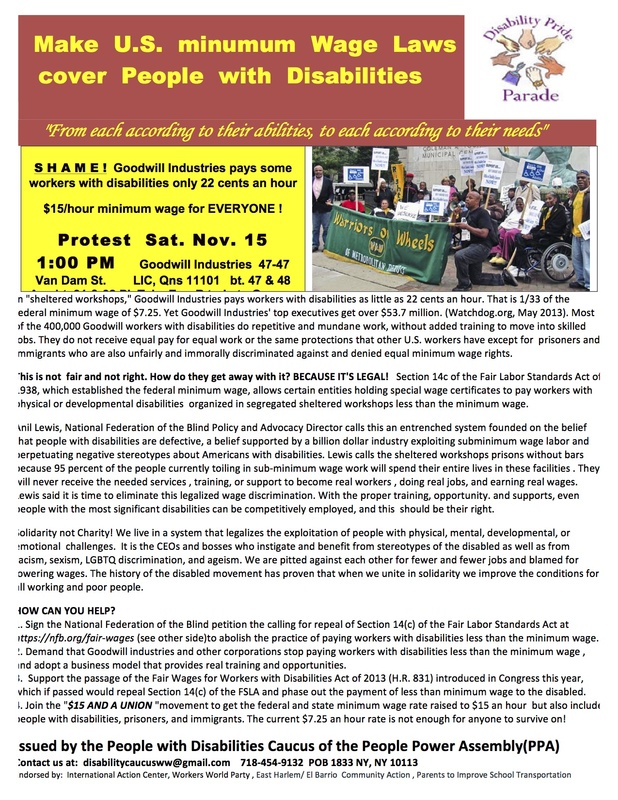 –Get the latest Oct 8 handbill (English y espanol). Since the Climate Change demonstration has no real target or demands, we think it is even more important to go to the demonstration with a call for people to come out and target the Wall street corporate heads who day-by-day cause economic and environmental devastation for poor and working people worldwide. Please try to meets us at 79th St. This is the area of the march reserved for anti-corporate, anti-capitalist, anti-war, peace & justice groups. We will have a table, leaflets, signs, and clipboards to sign people up; We hope you can help with distributing the leaflet. Although we really want people to meet up at 79th & Central Park West, the cops may make it difficult for people to get through on many streets. The march lines up along Central Park West from 61st St to 89th St. We will send out another email with more information about how to get to the meeting spot in a few days. Here is what we know at this time. All other cross streets will be closed. Train: Take the C or B train to 81st street (walk down to 79th St) or the 1 train to 79th and Broadway(walk down to 77th and over to CPW). -Wed, 9/17/2014: Join us for 3rd Anniversary of OWS. 41ST STREET & 7TH AVENUE (NW CORNER) Manhattan, NY 6:00am. The demand will be for $15 an hour wage. Please try to make it if you can! 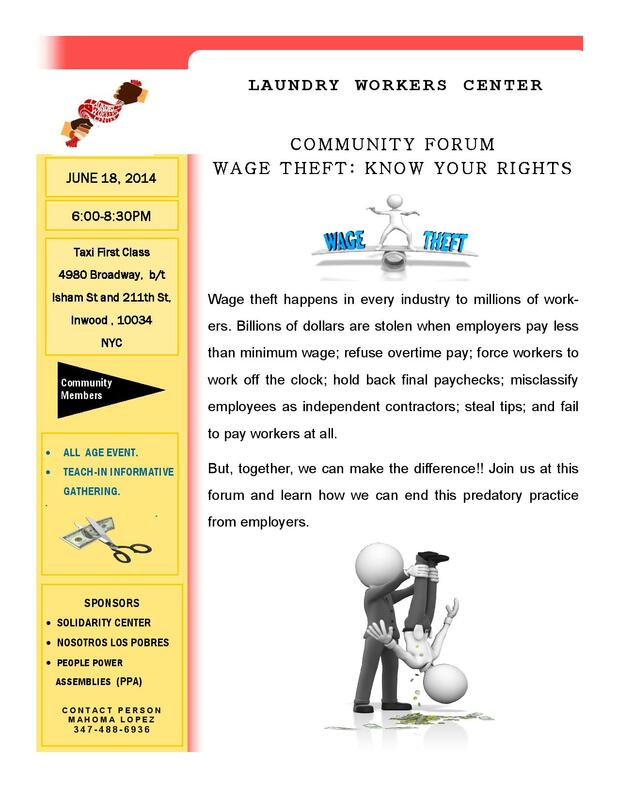 -May 19: Justice for Victims of East Harlem Explosion – Protest at Con Ed Stockholders meeting. DETAILS.